To explain: There’s the town of Shiprock, New Mexico, and then there’s the nearby 1,500-foot monolith from which the town takes its name. I've labeled the pictures to spare you the angst of guessing which is which. 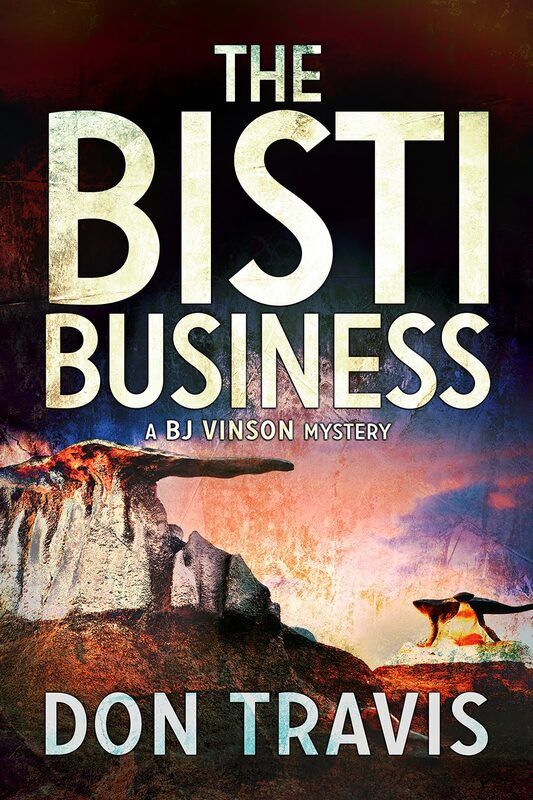 Our protagonist, BJ Vinson, goes to the town of Shiprock only once and never visits the rock formation at all, but both play a part in setting the scene for mystery I call THE BISTI BUSINESS. The Shiprock monolith, which lay in the distance ahead of us, was the throat of a volcano that had died long ago. The terrain around it eroded and washed away, leaving a 1450-foot pile of black basalt towering over the Navajo Nation. I rode with Gaines, while Lonzo followed in a county unit with Plainer as his passenger. Gaines did not seem inclined to talk, so I concentrated on the view outside the window. The trip wasn’t long, but it was interesting. We stayed on State Highway 64, by-passing the town of Kirtland, founded in the 1880s by the Latter Day Saints and presently boasting a population of around 6,000—and Fruitland. I didn’t know much about Fruitland, but Upper Fruitland across the San Juan River was predominately a Navajo town. One of these days, I was going to visit both. Before long, the huge volcanic plug called Shiprock hove into view like a massive, ocean-going vessel improbably landlocked on the high desert plain. A bustling commercial center bearing the same name sprawled across the mesa about 7 miles short of the monolith. The Shiprock Pawn Shop was right on the highway, housed in a one-story cinderblock building with two display windows crammed full of Native American jewelry and crafts. A weathered oak coup stick festooned with eagle feathers on a beaded leather band was the centerpiece of one display; a short lance similarly adorned dominated the other. I took a closer look. Hawk feathers, not eagle. Abe Novich, the owner, was a small brown man with a lean face and a jutting nose. His eyes sat well back in his head, which gave him a sly, crafty appearance. Given the trade he had adopted, the look likely reflected who he was. Pawnshop owners often have reputations as cheats, but in truth, both sides of the pawn game sought the upper hand. Unless they were sharp, the lenders were victims as often as they dealt a bad hand to others. A long-time pawnbroker friend in Albuquerque was one of the most knowledgeable men I knew. His expertise covered an astounding range of subjects. 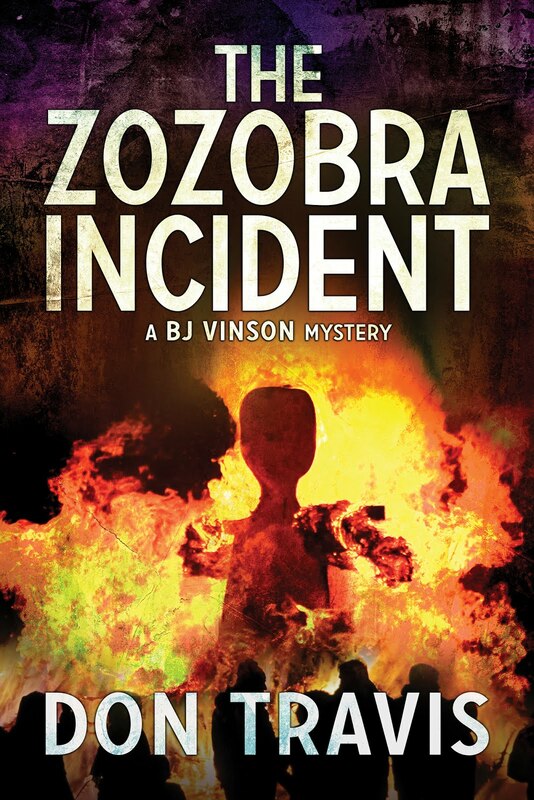 He could spot a fake Anasazi pot as quickly as he could pick out a genuine Han Dynasty urn. Gaines greeted the man by name—apparently they’d had dealings before—and then introduced me. The shop owner gave Lonzo a glare, which likely meant they’d crossed paths, and then fixed me with a fishy eye without saying a word. Plainer, the shopkeeper totally ignored. People skills were not included in his résumé. The FBI agent laid Lando’s toilet kit on the counter, and Novich’s face revealed he’d known all along the thing would prove to be trouble. In response to questions, he shuffled back to his office and started leafing through small pieces of paper. The computer age had not reached this store. Eventually he came back and uttered his first complete sentence since we entered. Gaines took Novich over his story several times. I gathered from the tone of the conversation Shiprock Pawn had had a few problems with its tickets over the years. We learned nothing beyond the original statement that Mr. Hernandez had brought in the kit. Now for a look at the two Shiprocks. 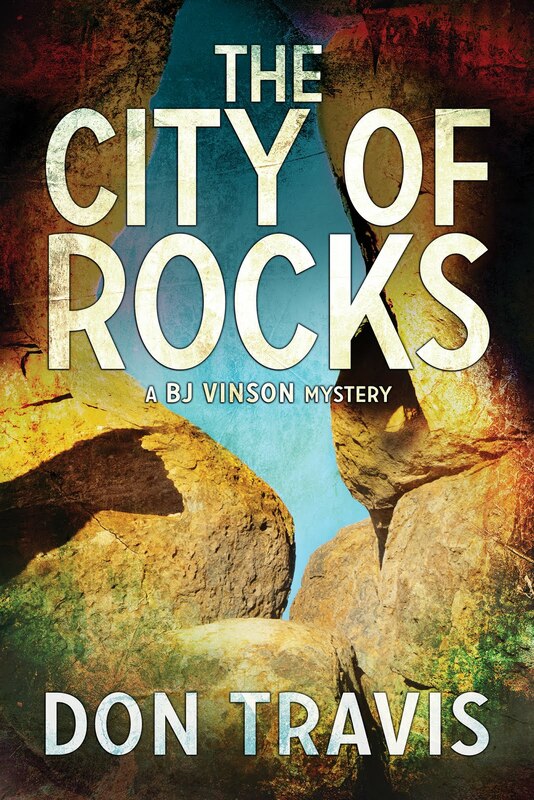 Let’s tackle the hunk of rock first. At my age and in my shape, this is the only way I can tackle it. Known to the Navajo as Tse Bit’a’í or the Winged Rock, it is a monadnock. If that word sends you scrambling for the dictionary, let me save you the trouble. The term describes an isolated rock, knob, ridge, or small mountain rising abruptly from gently rising or virtually level surrounding plains. It is thought be an Abenaki term for an isolated hill. This particular monadnock rises 1,583 feet above the high-desert plain on the Navajo Nation in San Juan County west of Farmington. Of course, when the Anglos came along, they saw things through different eyes and called it The Needle. USGS survey maps indicate the name Ship Rock came to the fore in the 1870s. The geological description of the peak is full of words like fractured volcanic breccia, black dikes of igneous rock called diateme, erosional remnants, and the like. Suffice it to say it is the throat of a volcano that solidified about 27 million years ago. Its dikes were exposed by another few millions of years of erosion. Shiprock sits in the northeastern part of the Navajo Volcanic Field. The Navajo name for the peak refers to the legendary great bird that brought the Diné from the north to their present lands, so it plays a significant role in their religion and tradition. According to myth, after being transported from another place, the Navajos lived on the monolith, descending to plant their fields and get water. When the peak was struck by lightning, the trail was wiped out, stranding women and children on top to starve. 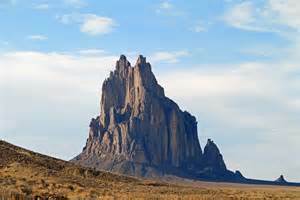 In another context, Shiprock is tied to a gigantic mythic figure made up of several mountains throughout the region. The Chuska Mountains are the body; Chuska Peak, the head; the Carrizos, the legs; Beautiful mountain, the feet…and Shiprock is either the medicine pouch or bow carried by this legendary giant. Other myths involve Bird Monsters nesting on the peak and feeding on human flesh. Legends differ over who rid the peak of the Monsters (Monster Slayer or the Warrior Twins), but two of the young Bird Monsters were turned into an eagle and an owl. The peak is mentioned in the Enemy Side Ceremony, the Navajo Mountain Chant, and is associated with the Bead Chant and the Naayee’ee Ceremony. The first recorded ascent of the monolith was in 1939 by a Sierra Club party, featured in the book, FIFTY CLASSIC CLIMBS OF NORTH AMERICA. The expedition was the first in the US to use expansion bolts for protection. At least seven routes have been climbed on the peak, all of great technical difficulty. Climbing has been illegal since 1970. The Tribal Council forbids the climbing of the rock lest intruders stir up the ghosts of those who died there…or rob their corpses. In spite of this—or perhaps because of it—rockers continue to see Shiprock as an interesting place to climb and continually seek to thwart the ban. Permits are issued to camp and hike in some areas, but not on any of the Sacred Mountains—including Shiprock. The town of Shiprock (or Naatáanii Nééz to the Navajo)—which is located on the Navajo Reservation twenty-eight miles west of Farmington—was founded by Superintendent William T. Shelton as a government settlement for the San Juan School and Agency in 1903. The Navajo name means Tall Chief in honor of Shelton. Shiprock is a key junction for tourist and truck traffic in the Four Corners, lying at the intersection of US 64 and US 491 (formerly US 666 until a petition resulted in a change of designation). Despite this, the town is noted for having no hotels or motels (a recent online search still didn’t reveal any). With a 2000 census of 8,156, the town is billed as the largest Navajo community in the Navajo Nation. It is the home to the Shiprock Chapter, a branch of the Navajo Nation’s government (which is probably the unnamed chapterhouse mentioned in BISTI). Chapters were initiated in 1922 as a means of improving agricultural conditions at the local level. They grew to be the basic political subdivision of Navajo Tribal Government. Each Chapter elects representatives to the Tribal Council, the Navajo’s legislative branch of government. The Shiprock Chapter has a checkered history. A few years back, some of the officials were accused of thefts and mismanagement to the point the Chapter could no longer pay utility or phone bills. The town is home to one of the eight campuses of Diné College (formerly Navajo Community College), a tribally controlled school. A Bureau of Indian Affairs agency, an Indian Health Service Hospital, and a branch of the Farmington Public Library are all located here. 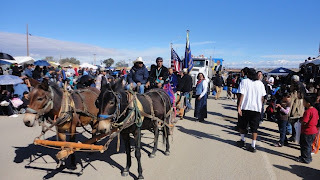 Since 1984, the town has hosted the Shiprock Marathon and Relay, and is home to the annual Northern Navajo Fair, which is the oldest and most traditional of the Navajo fairs. The event is held at the Shiprock Fair Grounds, typically after the first frost of the year, generally around the first weekend of October. The celebration includes arts and crafts, horticulture, science, agriculture, and livestock exhibits. There is a rodeo, and the Miss Northern Navajo Pageant, an Indian Market, parade, and carnival. Sounds like another interesting New Mexico locale to visit. Next week: Back to something personal.